Rick Davis is an agent with the American Secret Service. So far lacking the first issue of the 4-issue magazine which apparently contains the back-story of how Davis joined the Secret Service, I have only the information contained in his publisher's wiki but it is an excellent source of data. According to that data, Davis had worked in law enforcement for some time while awaiting the opportunity to test for admittance into the Service. When the chance for the test came, he passed "with flying colors". Very shortly ("within hours") he was on his first assignment. Since the Service has a rigorous training procedure its rookie agents had to go through, either Davis' experience was deemed sufficient or the need for his talents were so great normal operations were bypassed. Whatever the reason, he got his credentials and was off. How long he had been a policeman is not certain but based on his age it likely was a few years for Davis is not a spring chicken in his Service adventures, appearing to be in his early 30s at least. He has slightly wavy brown hair. He is clean shaven and, as was the custom during the 50s, invariably wore a suit no matter where he went. He often added a long trenchcoat to his ensemble and he obviously had several for sometimes he is seen in a brown one and other times it is canary yellow. In one of his adventures he states that he spent a couple of days preparing for a mission to Czechoslovakia including brushing "up on the language so that no accent would betray me to a native". How he came to speak Czech already is not mentioned. A different assignment has him adopting a Cockney accent well enough to fool London bobbies. Another mission has him flying a plane, in this case an old style bi-plane which he was able to handle but obviously preferred the more modern craft. When and how he learned to fly is not known. About his personal life we learn absolutely nothing. There is no mention of family or friends or anyone close to him. Being an internationally traveling agent with the Secret Service must be a very consuming occupation. At the end of WWII, Timely Publications, the comic company that gave the world Captain America, The Human Torch, and the Submariner, had decided to move away from the superhero genres and, changing its name to Atlas, switched to fresher fields like War and Western and Horror. 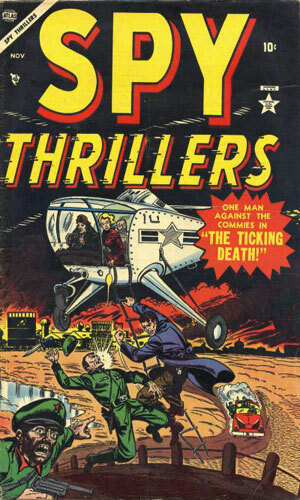 In the mid 50s, the fear of communism spreading about the globe made Spy fiction another area to try. It would never as popular as the others but it did have its chance. 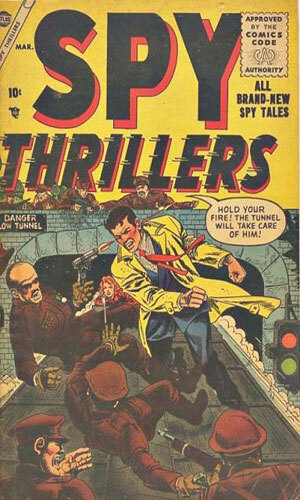 One of Atlas' spy heroes was Rick Davis, an operative thought well enough of to be the main star of the magazine in which he appeared but because he was a newbie, his name alone would never have prompted young men to pick the comic off the rack. 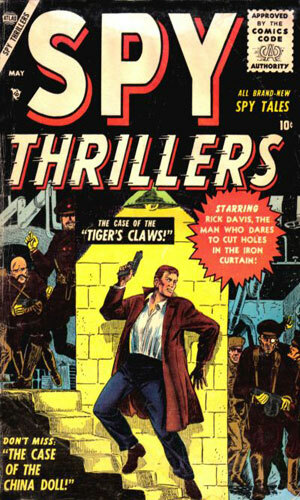 Something exciting like Spy Thrillers might, though, so that was the name of the publication in which Rick Davis would have several adventures. Even that name, however, would not keep the magazine going for long and after a short four-issue run, Rick Davis was heard from no more. I have given Joe Sinnott creator credit for Rick Davis based only on the fact that he was the artist who first drew the comic. He may not have been the one who actually came up with the idea but until I hear otherwise, he gets the glory. From Spy Thriller #1 - 6 pages - The introduction and origin of Rick Davis as an operative - Davis is tasked with protecting a scientist involved in H-bomb research. From Spy Thriller #1 - 6 pages - Rick Davis heads to Egypt posing as a communist agent to get his hands on secret documents before they do. From Spy Thriller #1 - 6 pages - A former Nazi scientist has created an especially powerful condensed explosive which Rick Davis is sent to Switzerland to get by any means necessary. 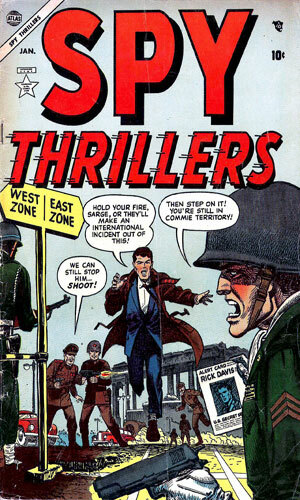 From Spy Thriller #2 - 6 pages - Rick Davis is in Czechoslovakia to rescue a scientist from behind the Iron Curtain. He has help but that help tries to kill him. From Spy Thriller #2 - 6 pages - Looking for how communist agents are planning on destroying America's food crops, Rick Davis goes to Iowa and finds a crop duster with some bad ideas. 6 The Case of the Telltale Machines! From Spy Thriller #2 - 6 pages - Pretending to be an angry American in England, Rick Davis infiltrates a band of Soviet sympathizers. One of the members seems especially suspicious. From Spy Thriller #3 - 5 pages - In Africa Rick Davis has the job to keep communist agents from convincing tribes from attacking the government. From Spy Thriller #3 - 6 pages - In New Mexico nuclear tests are being endangered by communist agents and Rick Davis is sent there to stop the operatives. From Spy Thriller #3 - 6 pages - The Hatchet Man is the nickname for a communist agent in Germany who is killing American contacts. 10 The Case of the China Doll! From Spy Thriller #4 - 6 pages - It is San Francisco and the China Doll Club is a hotbed of intrigue with Chinese agent Su Ming Toy. Rick Davis' job is to stop her. From Spy Thriller #4 - 6 pages - Rick Davis heads to India where a former Nazi spy now working for the communists is out to convince a Maharajah to side with the Soviets. From Spy Thriller #4 - 6 pages - Rick Davis is sent to the Netherlands to keep a communist plot to flood the market with excellent counterfeit American currency. The Rick Davis stories are fairly good spy adventures considering the storyteller only had 6 pages to set the scene, through Davis into things, give him lots of trouble to work out, and then have him come through to save the day. One impressive aspect of these tales is that the writers usually but not always had Davis get the upper hand - a few times his bacon was saved by others lending some realism to the stories. Hindsight makes me think the character would have fared better if there had been two longer stories with more character development rather than three short ones but since I never worked in the industry, what do I know. Davis certainly got around in the world, something more Secret Service agents do not, but he did not last very long.